Poor digestion can cause cramps, pain, bloating, flatulence and alterations to bowel movements. 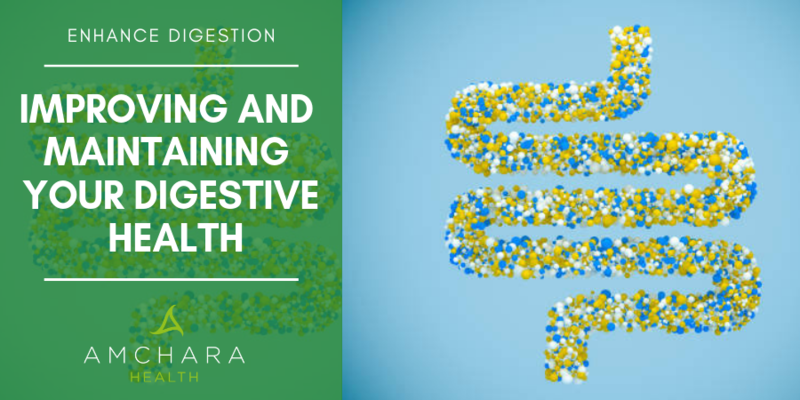 In the long-term poor digestion of food may affect absorption and contribute to nutrient deficiencies. Remove foods that are hard to digest, contribute to inflammation or irritate the gut – these include red meat, dairy, sugar, processed food, coffee, tea, alcohol and spices. Gluten-containing grains are linked to damage to the gut lining (1) and are best avoided. Soups, smoothies, juices and mashed vegetables are easier to digest and can be useful whilst trying to restore your digestive function. Include fresh brightly coloured fruit and vegetables rich in anti-oxidants which help to heal the gut and prevent further damage. Eat oily fish 2-3 times a week as they are rich in the omega 3 essential fats that help to decrease inflammation (2). Salmon, sardines, herring, tuna and mackerel are ideal. Eat smaller meals, these will be easier to digest and try to avoid snacking in between meals. A gap between meals allows the gut to naturally cleanse itself and help to restore good function. Avoid eating late at night, especially before bed. Take time to prepare food – this is the beginning of digestion. Handling a food during preparation and the smell of cooking stimulates the release of digestive secretions. This is essential to prepare your body for the meal that is about to come. Eat your meals in a relaxed manner at a table and chew your food well. Be mindful of your posture – sit up straight and do not slouch. This ensures your food is broken down into small pieces before it reaches the stomach, supports transit of food through the digestive tract and allows stimulation of digestive secretions. Apple cider vinegar with meals or a betaine HCl supplement can be useful in times of low stomach acid. (Not to be used in cases of peptic ulcer) Poor stomach acid may affect protein breakdown, leading to larger than normal pieces of protein entering the intestines where it ferments. Broad spectrum digestive enzymes will help to breakdown fats, proteins and carbohydrates and should be taken whilst eating a meal. Lecithin is a natural emulsifier and works, much like bile, to make fats water soluble and easier to absorb. It also supports the protective mucus in the gut and helps to keep a healthy gut lining (3). A probiotic supplement, containing beneficial bacteria normally present in the gut, may help the digestive process, absorption of nutrients and regulate bowel movements (4). Address stress – chronic or high levels of stress cause the release of hormones that suppress digestion. In a state of stress, digestion is seen as a non-essential function. Stress reduction techniques like gentle walks, yoga, Tai Chi, mindfulness and breathing exercises can all support digestion. Exercise regularly – this helps to keep bowel movements regular, improves feel-good chemicals and may improve inflammation in the gut (5). Aim to take part in 30 minutes of cardiovascular exercise 3 times a week and add in resistance training (weights) twice a week. Do you have any other tips to add to enhance body cleansing? Is IBS making you miserable?